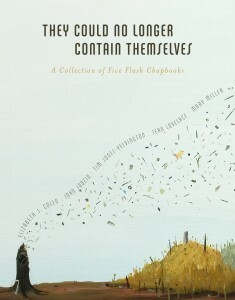 This collection of five flash chapbooks from five different authors (the four finalists from the fourth short short chapbook contest and the winner from the third) is as inspiring as it is moving, sad, funny, challenging. It’s basically everything you’d ever want from the written word, and it comes in such a damn tight package that, well, it’s wonderful. To me, being good at brevity in literature is like being good at reducing fractions in math. At least to a point. I don’t want that to come off as being too reductive (ha ha) because I know, from a literary standpoint, it takes more than just practice and patience to excel at short fiction; it takes natural talent as well, and there’s an abundance of talent throughout this book. However, I don’t want to just sit here and heap on the praise (although it’ll be tricky to do otherwise) so what I’ll do is give you—in the spirit of brevity—some short thoughts about each of the authors along with some short snippets from their respective work. We’ll begin at the beginning with John Jodzio’s collection Do Not Touch Me Not Now Not Ever. There’s a great playfulness in these stories, lots of twists, lots of random and weird and bizarre. Lots of great opening hooks, too. Jodzio, like all of the writers in this collection, is a master with the fishing pole. One or two lines in and the hook is set deep in the flesh of our cheek, my friends. We’re let go when they’re good and ready to let us go, and that’s okay because the ride is absolutely thrilling. Mary Miller’s collection Paper And Tassels comes next, and in my notebook I see the words beautiful, hard, and real, and these three words are still ringing true to me. Miller’s stories have a great bite to them, they’re filled with these painful little truths that are simply shocking in their openness. They sit right on the page, daring you to look at them. Her writing is, in my mind, consistently brilliant. Elizabeth J. Colen’s collection Dear Mother Monster, Dear Daughter Mistake draws out the sometimes pain of nostalgia and the often dangerous curiosity of precocious children. The collection itself is bisected, giving us equal parts adult mourning and coming-of-age crushes. It’s powerful, funny, and sad. Evan’s House And The Other Boys Who Live There by Tim Jones-Yelvington focuses on a young man’s stress in the face of peer pressure and the temptation of conformity, his explorations of love, and all of the shame and rage that comes with these things. Yelvington’s work here is tender and relentless, but also clever and humorous. He strikes an unexpected balance that gives the words endless appeal. Sean Lovelace’s How Some People Like Their Eggs, the final collection in the book and the winner of the third annual Rose Metal Press short short chapbook contest, wears its crown well. It’s funny, sad, surprising, inventive, playful, etc., and it reminds us that it’s okay to relax, it’s okay to laugh, it’s okay to not be so damn serious all the time. And these are nothing if not welcome reminders. Purchase They Could No Longer Contain Themselves HERE.